The nineteenth century Great Hedge of India was probably the largest example of a hedge used as a barrier. It was planted and used to collect taxes by the British. Inland Customs Line incorporated the Great Hedge of India (or Indian Salt Hedge). G.H. Smith, during his twenty-year tenure as the head, expanded the system into a "Customs Line" around Bengal. Salt had to pay duty to cross this line. By the 1840s, the Company had constructed a 14-ft-high, 12-ft-thick thorn hedge on the Western side of Bengal to prevent entry of contraband salt. Later, after 1857, the Customs Line grew until it snaked some 2,500 miles across India from the Himalayas to Orissa. The hedge was expanded into a spiky gnarl of prickly pear and acacia. Salt in India is perhaps contemporaneous with the birth of History. Indian agriculture. Ita most ancient Sanskrit name, Ldvana, has few, if any, other meanings than salt or saltness. Susruta, the father of Indian medicine, speaks of four kinds of salt, and these correspond with the four chief grades known to-day, viz. Saindhava, the rock-salt of Sind and Kohat ; Sdmitdra, produced from the sea ; Romaka or Sdkam bari, Sambar Lake salt ; and Pdnsuja or Ushasuta, salt produced from saline earth. Although India possessed a mountain range of rock-salt, immense beds of salt-bearing soils and a vast extent of salt lakes, as well as many hundred miles of sea-coast where sea-salt might be manufactured, the conviction prevailed in the 19th Century that it did not pay to carry salt over more than some 300 to 400 miles, by internal routes, from any center of supply. Bengal had always been largely dependent on external sources. Owing to the immense amount of fresh water poured into the Bay of Bengal, it did not pay to manufacture sea-salt near Calcutta. The chief deposits of rock-salt are in the so-called Salt Range of the Panjab. The Sind Saugor hills traversing a desert, and themselves as barren, are inexhaustibly rich in iron ore, slate, lignite, gypsum, and the rock-salt. This last lies in strata cropping out from the hill-sides, and penetrating them in veins of wonderful fecundity. It requires no operations for recovering, but excavating and pounding. The grain is of perfect flavor and purity, except when the proximity of the iron-stone has reddened the saline mass with a peroxide. This is the case most frequently beyond the Indus, which cuts the range at Kalabagh. The salt dug there was very lightly worked, but the frontier custom-line, following the river, shut it from the Punjab. Bengal and the greater part of Burma obtained their salt Bengal, by importation. Under the Muhammadan rule a tax was levied on salt Muha by means of imposts on the privilege of manufacture, and by duties on the transport of salt from the places of manufacture to the interior of the country. Later on a system was gradually matured which provided for the control, the manufacture, and sale at the agency to the Company's servants. This was introduced by Olive and perfected by Warren Hastings warren in 1765 to 1780, and it survived in a modified form till 1862. A Government salt monopoly similar to that which existed in Bengal was introduced in the Madras Presidency at the beginning of the 19th century. In Bombay salt did not become a considerable source of revenue till 1837. North India embraced the United Provinces, the Central Provinces, Rajputana, Central India, the Panjab, and the North-West Frontier Province. Its sources of salt supply were Sambhar, Didwana, Pachbadra and Sultanpur evaporation works, and in addition the salt-mines of the Salt Range of Kohat and Mandi. Under the Sikh Government salt was one among forty-eight articles liable to customs, excise, town or transit duties. But the Sikh Government did not establish any system of management nor a fixed scale of duties. Since taken over by the Government of India the manufacturing and preventive operations in North India were directly controlled by the Northern India Salt Departement. Along with salt duties, the British administration inherited an immense number of transit duties, levied at intervals along the trade routes under a system requiring elaborate customs arrangements and involving an intolerable hindrance to trade and communication. In 1843 the transit duties, with the exception of those on cotton and sugar, were abolished, and the loss of revenue was partly made up by enhancing the Provincial salt duties. It had been necessary in order to maintain the Salt Tax to establish (in 1843) an inland custom line which extended across the whole of British India from the Indus to the Maharadi on the borders of Madras. Along the greater part of its length it was a huge material barrier which Sir M. E. Grant Duff, speaking from personal observation, said could be compared to nothing else in the world except the great wall of China; it consisted chiefly of an immense hedge of thorny trees and bushes, supplemented by stone walls and ditches, across which no human being, or beast of burden, or vehicle could pass without being subjected to detention and search. If this custom line had been put down in Europe it would have stretched, in 1869, from Moscow to Gibraltar. It was guarded by an army of officers and men some 12,000 in number, divided into beats, which were constantly patrolled by day and night and watched by 1700 guard posts. It may easily be imagined what obstruction to trade, what abuses and oppression, what annoyance and harassment to individuals took place. It is unnecessary to enlarge on the obstruction to traffic of all kinds to which this object lesson of the abuses of a protective system gave rise, although the actual duties levied were confined to salt and to sugar produced in British territories passing into native states, and sometimes from one British territory to another. It was on 18 January 1850, that all the town and transit, export and import duties, levied in the Punjab Proper, were swept away. The western line of stations, running along the banks of the Indus, as far as Mittunkote, on the frontier of Scinde; the line along the foot of the hills, which guarded Kashmir, and the line on the banks of the Sutlej, together with the timber- Chap. X. duty stations on the rivers Ravi, Chenab, and Jhelum, were, as toll-bars, abolished. The whole trade of the Punjab, the traffic from Central Asia, the ingress of merchandize from older British provinces, was left to flow, free and unshackled, in every direction. After annexation, the administrative Board set itself to re-model the department of the revenue. It swept away all custom-lines, and set free from toll and duty, all ports and passages but the ferries, and all productions but spirits; providing, to meet these reductions, a stamp duty like that obtaining in the older provinces, and a duty on salt of two rupees on the Company's maund. The cis-Indus mines easily supplied all demands, producing, so early as 1854, nearly a million maunds. Under Runjeet Singh, the seven excavations had been farmed out like the land-taxes. The contractor might sell or hoard, without restriction in time, price, or place, while he kept his contract with the Maharajah. No less a man than the astute tyrant of Cashmere, the Dogra Goolab Sing, grew rich from these neglected hills, under the easy Lord of Lahore, and built his throne of gold from the poor man's salt. The salt mines were taken under the direct management of the State, instead of being farmed out to contractors, as they had been; and the excise duty of two rupees a Company's maund, was made payable on the delivery of the salt at the mouth of the mines. When the state assumed the direct working of the mines, it was found to have been carried on by a rude and unskilful process. The entrances to, and galleries along, the quarries, were irregular, winding, and narrow. The carriers of the article, women and children, could hardly crawl about them. The supply of water was scanty, and what there was, brackish. The place where the salt was weighed before delivery to the merchants was confined, and exposed to wind, wet, and heat. A rocky road ran along the gorge to the Khewra mine, and was most dangerous for loaded animals. All these difficulties were remedied by the judicious suggestions of the Head of the Government. On the other hand, prohibitions against smuggling were enforced by considerable penalties. Carriages and packages might be searched on reasonable suspicion. Salt in excess of one seer, not covered by a pass, might be detained within a circuit of tea miles round each mine; no person not licensed could excavate the article; and the manufacture of a baser quality, which used to be carried on in the districts of Mooltan and Jhung to a considerable extent, but in a rough fashion, was put down by law. This salt, made by washing the efflorescent earth, had been taxed by former Sikh governors, and in fits of morality the manufacture had been prohibited altogether. The British Government, which had removed so many other taxes on trade, and on the very necessaries of life, could not be condemned for the enforcement of this single prohibition, which was imperative for the revenue, and for the public health. The cotton duties were abolished in 1855, while the salt duties were gradually raised until in the period from 1869 to 1877 the salt tax in Lower Bengal was Rs. 3-4 a maund, in the Upper Provinces Rs. 3, in the country beyond the Indus a few annas, and in Madras and Bombay, Rs. 1-13 a maund. The salt sources of Rajputana belonged to the Native States in which they were situated, and duty was levied on their produce when it crossed the frontier. Upon annexation the management of the cis-Indus and Kalabagh mines was at once taken over by the British Government. An excise duty of Rs. 2 a maund was levied at the mines, in lieu of all charges to which the salt was formerly subject; and on payment of this duty the salt was allowed to pass free throughout the British dominions, subject only to the additional duty of 8 annas a maund levied on all salt crossing the branch customs line established for the protection of the Bengal revenue. The duty imposed was considerably higher than the prices charged by the farmers for salt under the Sikh government, but all articles except salt and liquor were exempted from excise, customs, and transit duties. 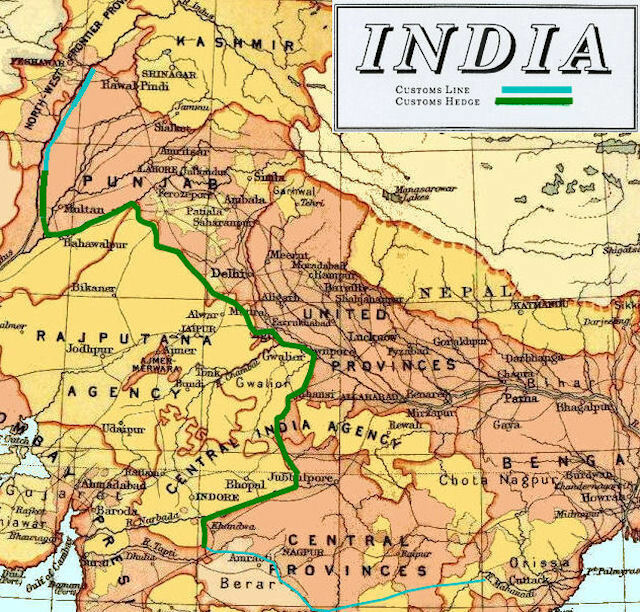 The Imperial customs line was at the same time extended along the Sutlej and the Panjnad to the Indus at Mithankot, and a preventive line was established on the Indus to exclude Kohat salt from the cis-Indus portion of the Province. The manufacture of alimentary earth-salt in the cis-Indus Punjab was also prohibited. These arrangements could be maintained only by stringent preventive measures. To prevent untaxed Rajputana salt, and the lightly taxed salt from the south and west, from coming into Northern India, it was necessary to maintain a customs-line extending for nearly 2,500 miles, from Torbela, near Attock on the Indus, to the Sambalpur district of Bengal. The line was guarded by an army of nearly 13,000 officers and men, and consisted, along a large part of its course, of a huge cactus hedge supplemented by stone walls and ditches. It must be remembered, however, that this line took the place of a more annoying system of innumerable customs ports scattered throughout the interior of the country. The only line of customs which it was imperative to extend, was the line of the N. W. provinces, meant to guard the ingress of salt from Rajputana; and this was prolonged from Fazulkote on the Sutlej, down that river and as far as Mittunkote, below Mooltan. The effect of this prevention was to exclude the Rajpoot salt from surreptitiously entering the new British provinces through the native states of Bahawalpore and Bikanir. Salt in India is a necessity as well as a luxury, and a salt-tax can never be quite defensible. In this case, however, it is enough to say, that under the increased burden, salt was not only as largely consumed as ever, but, in 1854, had nearly doubled the revenue by increased sales; and passing the Beas and Sutlej without impost, had supplanted in the cis-Sutlej states the unwholesome Mundee mineral. With the sanction of the Governor-General in Council, the Hon'ble the Lieutenant-Governor declared that, from the 1st of April 1870, the charge of the Sutlej Customs Line, the Indus Preventive Line, and the Salt Mines in the Salt Range, heretofore vested in the Commissioners of Multan and Rawalpindi, respectively, were vested in the Commissioner of Inland Customs, who exercised the same control over the entire Salt and Customs Department in the Punjab that he did over that in other Provinces. The Commissioner of Customs is also invested with the general control of the Salt Mines in the Kohat district. The Sambre Salt Lake, which was taken over by the Indian Government in 1871, was the source of salt for Northern and Central India. The quantity to be had here and in the river Loony is unlimited. This river falls into the Gulf of Cutch, and for many miles near its outlet the salt is very pure and line. Millions of tons of it are yearly washed away by the sea in the Eun of Cutch. The Sambhar Lake, it is believed, had been worked for salt for the past 1,400 years. It is about 20 miles in length, the breadth varying from 2 to 7 miles, and it covers an area of 90 square miles. The surrounding country is sandy and sterile, with the great Indian desert to the westward. A variety of disorders had been produced in the financial policy of a country in which successful government especially depended upon finance. From 1849 to 1869 the salt mines and quarries in the cisIndus Punjab and at Kalabagh and the preventive line on the Indus were under the management of the Provincial Government; but in 1869 the Government of India assumed the direct control of the inland customs department, and the administration of the salt revenue in the Punjab was at the same time made over to the Imperial department. In 1870 the Government of India acquired a lease of the Sambhar Lake, with a view to increase and cheapen the supply in the United Provinces ; and in 1874 over 760 miles of the eastern portion of the Customs Line were abandoned, the trade in this direction having concentrated itself on the railway route. The necessity of changing the whole system was at the same time indicated by Lord Northbrook. Important forward steps were taken by Lord Northbrook. The salt duty, the great obligatory tax which fell on the masses of the Indian population, was freed from any objection save that which affects all taxation of the very poor. In 1875, when the first breach was made in the system, the amount of the duty varied in different provinces in some of which it was oppressive to the last degree. Treaties were made by the Native States concerned, and in 1878 the Bengal duty was lowered to Rs. 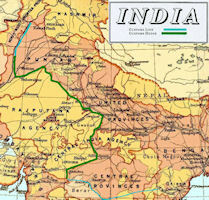 2-14 a maund, and the duty in Northern India to Rs. 2-8. At the same time the duty in Madras and Bombay was raised from Rs. 1-13 to Rs. 2-8 a maund. Lord Northbrook's Government initiated the work of its destruction which was completed under Lord Lytton by Sir John Strachey in 1878. Lord Lytton's Government was able to acquire the remaining salt sources of Rajputana and to equalise the duties throughout the greater part of India. The whole customs-line was abandoned in 1879, with the exception of a portion along the Indus, maintained to prevent the still lightly-taxed Kohat salt from being smuggled across the river. The final equalisation of the duties was deferred until 1882, when this measure, together with the reduction of the salt duty to two rupees per maund, formed part of the great budget of Major Baring (later Lord Cromer). By fiscal changes, and arrangements with native independent chiefs, the monstrous hedge, or Customs line, was abolished, and by approved appliances the cost of getting the salt was largely reduced. The preventive line on the Indus was withdrawn in 1896, when the duty on Kohat salt was raised to Rs. 2 a maund of 102^1 lb. The transport of this salt to cis-Indus territory, both in the Punjab and in the Frontier Province, was, however, still prohibited. The subsequent policy was to work salt so economically and scientifically that the tax may assume the form of ordinary profit on production and be collected before delivery to the traders, so as to place its subsequent movement free of all restraint. This, when contrasted with the vexatious and expensive system inherited by the British administration, was a vast improvement. Salt was readily available throughout the Empire, its price was equalised, facilities of traffic increased, and a system of credit established.